"On Thursday last Vice-Admiral Lord Nelson, arrived in this city on his road to Lord St. Vincent, at Tor-Abbey near Torbay. Intimation having been previously received of his Lordship's expected visit, he was met about two miles from this city by Sir Stafford Northcote's troops of 1st Devon Volunteer Cavalry, who escorted his Lordship to the Hotel, amidst the loud plaudits of an immense concourse of the inhabitants. ...." See Nelson's Freedom for more. "Yesterday the largest ox that has been seen in this city for some time, fed on the grounds of the Right Hon. Lord Courtenay, was slaughtered by Mr. George England, butcher, in the butcherow. - Its weight is about 16 hundred, and it measures (a) full 8 inches thick on the breast. - This large and fine animal was felled in an instant, by the new method of laying, cattle : - how much preferable must this be, to the old practice of beating down a poor animal with a fledge-hammer." 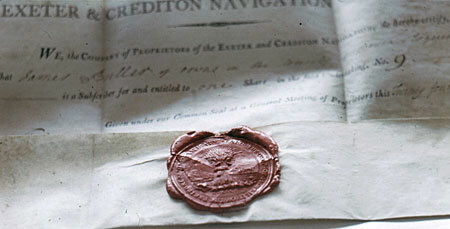 An Act of 1801 "for improving and extending the navigation of the River Exe, from the public quay at Exeter to the public road adjoining Four Mills near Crediton, in the County of Devon, by making a navigable canal or cuts". Acquisition of land began in 1808 but only ½ mile of cut was made in 1810. 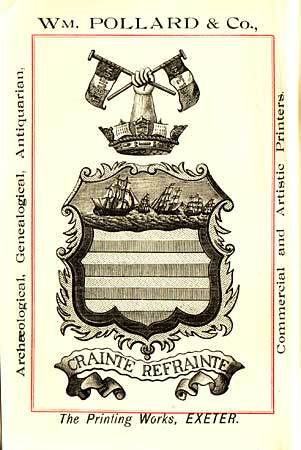 In 1818 the scheme was abandoned and the Company subsequently wound up. The entrance lock to the canal was discovered, opposite the Mill on the Exe, and explored when the Exwick flood relief channel was excavated in the late 1960's. 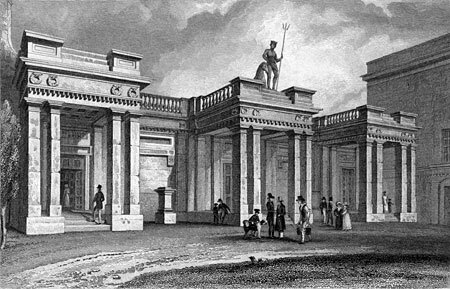 This grand neo-classical bath house was constructed on the corner of Southernhay and Dix's Field in 1821. A natural spring on the site was used to feed the hot and cold baths and showers. It became a social meeting place for the wealthy to meet and gossip. Over the entrance was a classical statue of Poseidon clutching a trident, flanked by a mythical seahorse. Demolished in 1868 and replaced by the Congregational Church. Last week the Right Worshipful the Mayor and Chamber voted the freedom of this city to Field-Marshal the Duke of Wellington, to be presented to the illustrious Hero on a Gold Box of One Hundred Guineas value." 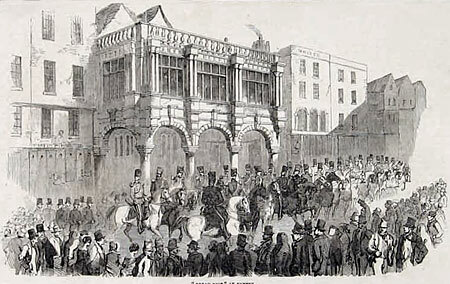 At a very respectable Meeting of the Inhabitants of this City, held at the Guildhall, pursuant to public advertisement, to consider the propriety of entering into a SUBSCRIPTION for the RELIEF of the WIDOWS and ORPHANS of those brave Heroes who fell in the late glorious and decisive Battle of WATERLOO." "In the case of prisoners dying of cholera in Exeter gaol, the Governor is, by an Order in Council, empowered to bury them, without being liable to the necessity of holding an inquest on the bodies." "The Cholera - We regret to have to state that this disease still makes progress among us. It is true that it is as yet confined to the lower half of the city, and more elevated parts being as we believe up to this time unvisited by it. 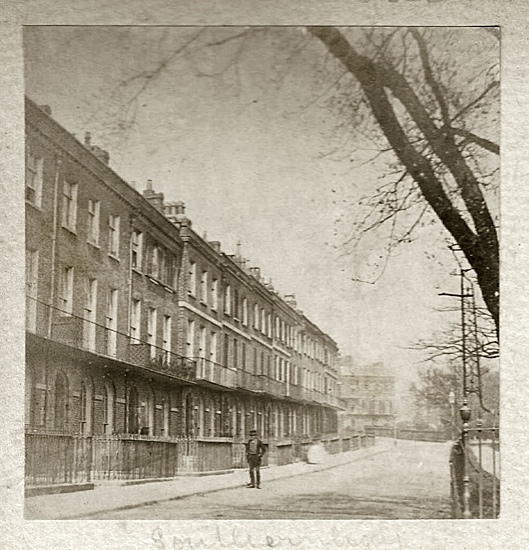 The victims, too, have very generally been of the poorer classes, and certainly incaution and intemperance have in some of them been the predisposing causes...."
Lawrence Radford built the house which was named Radford Place. It was fortified during the Civil War and become known as Mount Radford. John Baring, a wealthy Exeter wool trader and banker purchased the house and in 1770 converted it into an elegant red brick Georgian house. St Leonards Road was the drive to the house. The house was demolished in 1902. "SATURDAY - A Horned Case. - Mullings and Denner V. Knight. - Perhaps few things in the world have proved more annoying to man-kind than "horns," and it appears to be the misfortune of Messrs. Mullings and Denner to have a "horned' neighbour; in truth the room almost immediately adjoining their bed-room is occupied by a cow! It is not, however, to the propinquity of this useful animal (notwithstanding its horns) that these gentlemen so much object, but then she is such a roarer that her neighbours can take no rest, for no sooner do these desire to consign themselves to the arms of Morpheus, than she, envying their happiness, and apparently annoyed at the thought of being alone, sets up a bellowing such as frights 'gentle sleep" from the whole district. A wag in Court remarked, perhaps she wanted a May-fly, and Mister Knight said, he meant to provide her with a mate. The Court observed that as to this being a remedy for the evil it could give no opinion, but advise him to endeavour to abate it, as though that Court was not the place in which the complainants were to seek their remedy, still there could be no doubt but that he was liable to indictment for a nuisance." 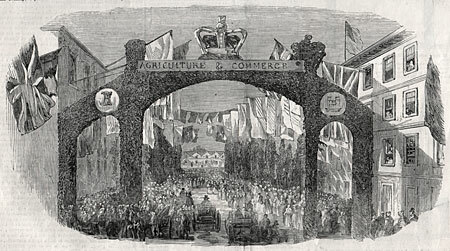 The Royal Agricultural Society of England held their annual meeting during July 1850 at Exeter. The city celebrated the event with enthusiasm, and at least five decorative arches spanned the streets. This example was designed and constructed by Mr John Mason in Queen Street. 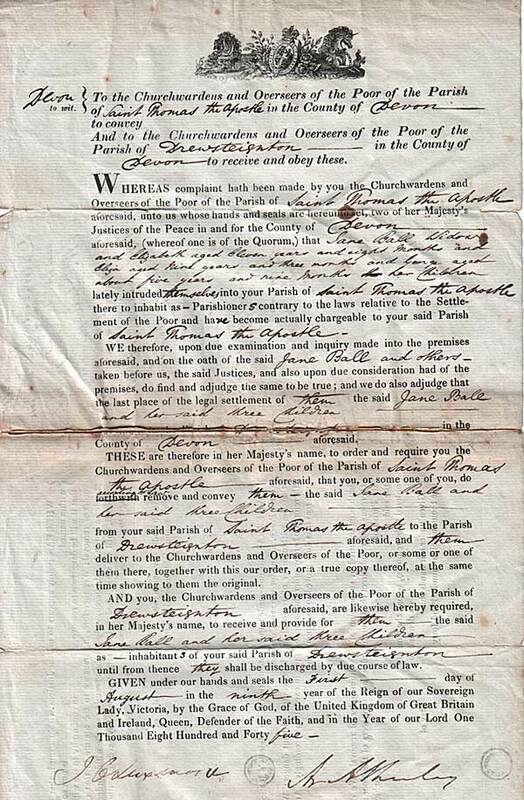 This document from 1845 was issued to the Churchwardens and Overseers of the Poor of the Parish of St Thomas. It was found that Jane Ball, widow, and her children Elizabeth age 11, Eliza age 9 and George age 5 had become destitute and were chargeable to the parish. The order was for them to be conveyed to Drewsteignton which was not part of St Thomas – they did not want to pay to keep them at Redhills Workhouse. The reverse of the document had the hand written note "Delivered the within named Paupers to Mr Samuel Sorell Assistant Overseer of Drewsteignton September 1st 1845 - J Stocker assistant Overseer of St Thomas - Jane Ball, widow & 3 children." This document was found among the papers of St Andrew's Church and is reproduced with the permission of the Vicar, Jerry Bird. "On Thursday afternoon one of the most tremendous thunder storms which the inhabitants of Exeter have seen for a generation visited the city. the earlier part of the day was fine; but about half-past 4 o'clock the storm commenced with great violence. Torrents of rain, accompanied by hail, fell, and soon deluged the streets. The flashes of lightning were exceedingly vivid, and the peals of thunder most terrific. During the storm, a house, called Double Lock, on the banks of the Exeter Canal, was struck by the lightning. Some persons who were standing in the passage, at the back of the house, were struck by the electric fluid, and one of them, a gentleman named Burnham, was killed on the spot. He was struck on the head and died instantly. Two young men standing near the deceased were struck down, and their limbs, especially the lower extremities, are paralyzed. Two persons were standing at the door of the passage where the catastrophe occurred, and it is a singular fact that the lightning passed over them, leaving them perfectly unhurt, and struck the group within the passage, The storm lasted three hours, and has been succeeded by fine weather." "It having been resolved at a Public meeting held at the Guildhall... That it is... desirable that the Public Clocks in this City shall be set to Greenwich Time and the Right Worshipful the Mayor is requested to communicate with the authorities having charge of the principal Clocks with a view to the attainment of this object... NOTICE IS HEREBY GIVEN: That upon and after Tuesday the Second Day of November next, the Cathedral Clock and other public clocks of this City will be set to and indicate GREENWICH TIME. William Willis Hooper, Mayor." Note - Exeter is 14 minutes ahead of GMT. The Royal Public Subscription Rooms were opened in 1820 to provide a place for exhibitions, meetings balls and other events. 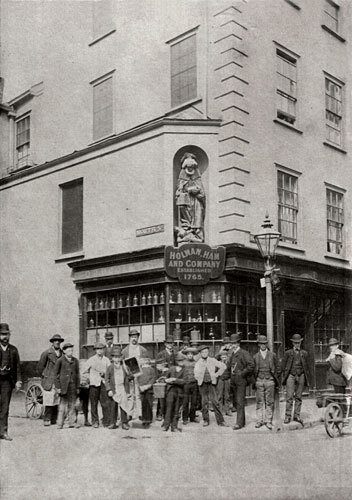 It was situated in London Inn Square, where you would now find Boots the Chemist in the High Street. 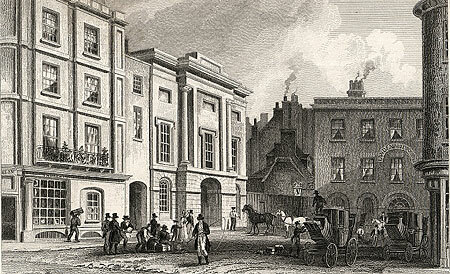 Set back in the square to the right of the rooms was the New London Hotel, that was constructed for John Land in 1793/4. It was demolished in 1936 and was replaced by the Savoy/ABC Cinema. Now the site is Waterstones the bookshop. The Royal Public Subscription Rooms were converted into the Hippodrome theatre in 1909 by Fred Karno and the Plaza Cinema in 1931. 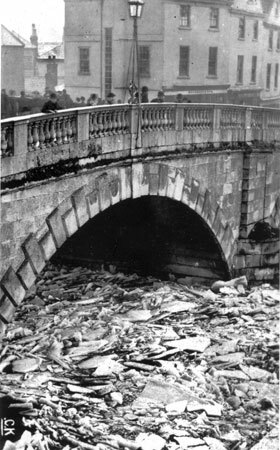 It was destroyed by a single bomb on the 4 May 1942. "After a very careful inquiry into the facts of this "Exeter Bread Riot," as it is termed, we must confess that we are at a loss to discover its precise origin. Some say it commenced in the west quarter, the rendezvous for the idle and the dissipated; others, that the plan had been organized some time, and that the "rise" was more general; others that it was caused by a few ragged women and children, who demanded bread in their soup, in the Lower-market, on Monday. We are inclined to believe that the honest poor and the industrious artisan had little or no part in the matter." The local police and the 3rd Light Dragoons were called out to suppress the bread riot of 1854. Here they are depicted outside the Guildhall. Upwards of 200 people had passed through St Thomas vandalising and stealing from local bakers before going on to the house of a Mr Trood where they stole cider before the militia arrived to prevent further damage. 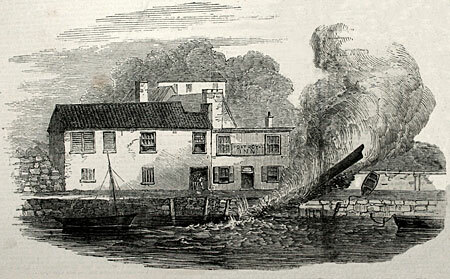 On 7 September 1850, a four-oared gig moored next to the Port Royal public house, on St Leonard's Quay, was picked up by a sudden swirling wind and lifted some 15 ft above the river. The boat was then dropped back into the water, as amazed customers looked on. The incident was reported in the Illustrated London News. See Port Royal for the full report. It became somewhat fashionable to roast an ox in the open air during the 1860's and 70's. This roasting was in the castle yard. The Cathedral Close was also used for such an event, when an ox was roasted using a newly invented gas spit. 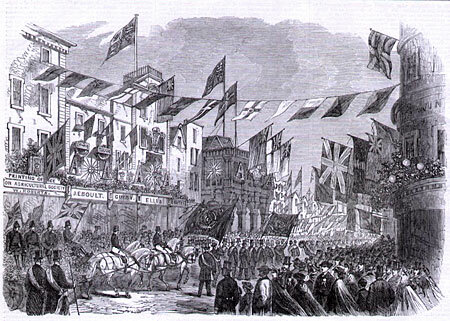 The MAYOR presided, and having explained the object of the requisition in pursuance of which the meeting had been called, said, - The high character and position of the Prince Consort, the profound grief at his untimely death, and the deep sympathy felt for Her Majesty so universally, leaves no doubt on my mind that the proceedings on this occasion will be such as to maintain the character for loyalty and devotion to the Sovereign and the Royal Family which has ever characterised and distinguished this ancient city. - (Cheers.)" 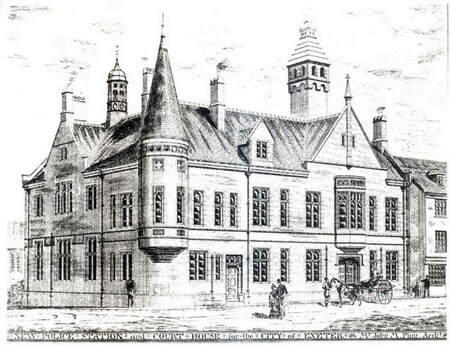 From the Flying Post, 11 March - "The Guildhall soon became the centre of attraction; and when at ten o'clock the Right Worshipful the Mayor appeared, accompanied by the High-Sheriff of the city, the Sergeants-at-Mace, the Sword-bearer with the ancient cap of maintenance, the Town Clerk, Aldermen, and Councillors, he was greeted with a hearty and general cheer. The line of the procession was soon formed. It was preceded by the Artillery Corps band, and proceeded .... to the Cathedral." 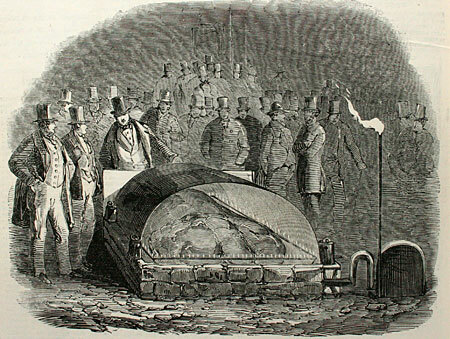 Picture from the Illustrated London News. "ELIZABETH SMITH, of Topsham, was summoned by P.C. Parker for creating a disturbance. The officer stated that on Sunday, the 13th inst., he saw "Lizzie" in a state which plainly proved that she had been indulging rather too freely in the cup that cheers, but which inebriates. There was a large concourse of people to listen to her musical voice, which she was not backward in raising to concert pitch, and to witness her graceful evolutions. She said she had nothing to say in her defence as she thought the Bench would not deign to lend a willing ear to her tale, and would believe the officer in preference to her. She was sent to prison for seven days, without the option of a fine. The prospect of a week's incarceration was anything but pleasing to her for indulged in a rather violent show of grief." 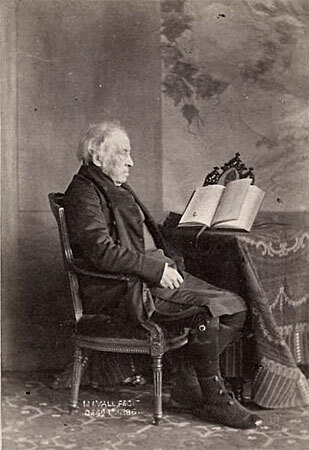 Arguably, the most disliked Bishop ever appointed to Exeter, the irascible Phillpotts was accused by Thomas Latimer of abandoning the city during the 1832 cholera outbreak. He later took Latimer to court for libel, after Latimer accused him, in his newspaper, of not telling the truth regarding dealings with the Rev. James Shore of Totnes. It is said that locals would throw rotten fruit at him when he passed in the street. He was implicated in dealings with the slave trade, through investments in the West Indies, and he reputedly produced a pamphlet supporting the massacre of eleven people at the Peterlee Massacre in 1819. He was not a man worthy of his position. Dr. Frederick Temple was enthroned as Bishop of Exeter on the 30 December 1869. He became the Archbishop of Canterbury in 1896. His son, WIlliam Temple was also Archbishop of Canterbury. 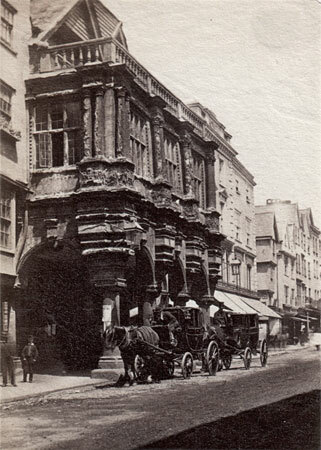 A very early albumen photograph of the Guildhall is distinguished by the two carriages parked outside. The soot on the stone is apparent and the Guildhall today is much lighter and cleaner. 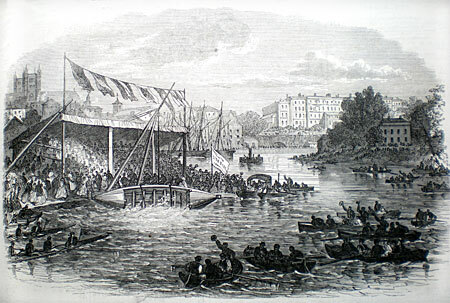 Exeter had provided a new lifeboat for Brixham in 1866 when it was paraded through the streets. Exonians were fond of their lifeboat, probably because the city still had ships registered to its port, and occasionally, an Exeter registered ship was lost at sea. Possibly the first foundry to open in Commercial Road, Bodley and Son traded between 1790 and 1967. 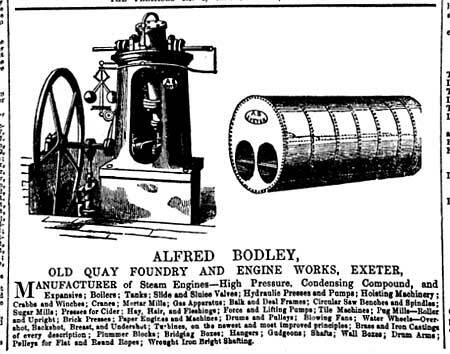 The advert from the Flying Post shows they could manufacture complex steam engines and boilers. 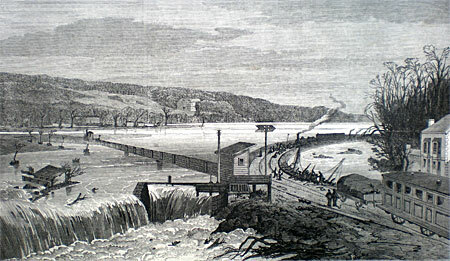 This flood in January 1866 damaged the railway line at Cowley Bridge; Pynes, the house of Sir Stafford Northcote MP can be seen in the distance. The Illustrated London News reporter wrote "the marshes on each side of the Exe, from Cowley Bridge to St. David's station, were one grand and stormy lake. Where the hedges had been swept away, they were covered by the waters, and their locality only known by the elm-trees which towered above the flood. From Cowley Bridge the lake extended itself upwards over the River Creedy Vale, as well as up the valley of the Exe." The Earl of Devon opened the 120 bed Wonford House on the 7th July 1869. The new building was large and airy, with a grand entrance up a flight of steps. The hospital replaced the old Bowhay House, but was still only available to those who could afford to pay for treatment and care. Now named, Exe Vale Hospital, the extensive grounds also accommodate the main Royal Devon and Exeter Hospital. 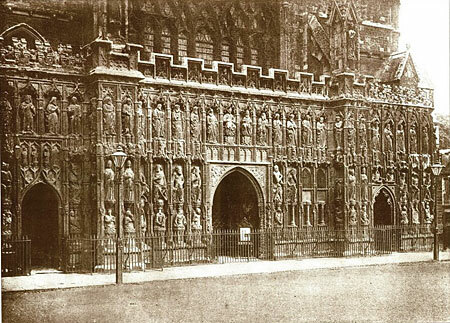 An early albumen print, this time of the entrance to Rougemont Castle and the Devon County Court. 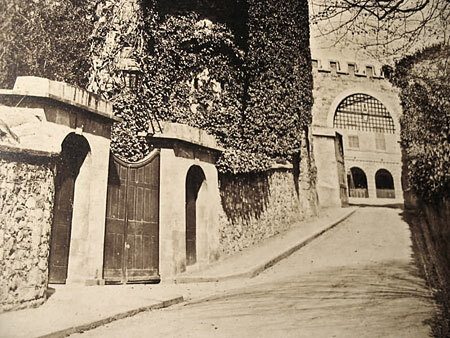 This entrance is comparatively modern as originally the castle entrance was over a draw-bridge and through the ivy-covered entrance tower on the left. This illustration appeared in the Illustrated Police News in 1879 when the body of a six month baby was found at Powhays Mill. 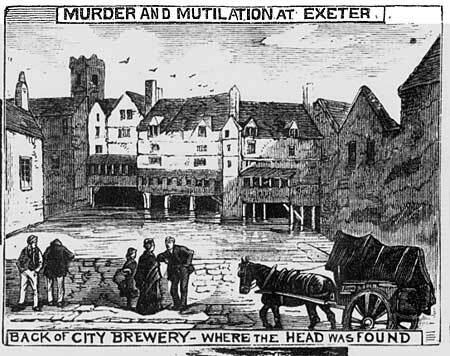 The head of the mutilated child was found in the leat at the old Exe Bridge. Eventually, Annie Tooke, a child minder, was arrested and found guilty for the murder. She was hung in Exeter Prison on the 11 August 1879. 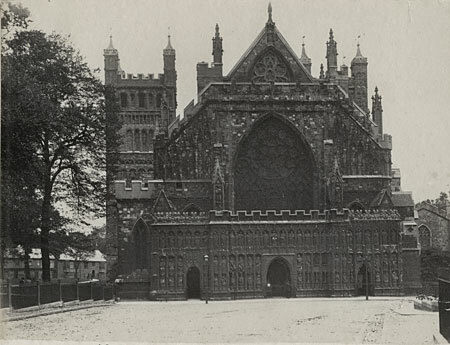 Every November 5th 'young Exeter', as they were referred to, would assemble in Cathedral Yard to build a bonfire, which inevitably ended in rioting. 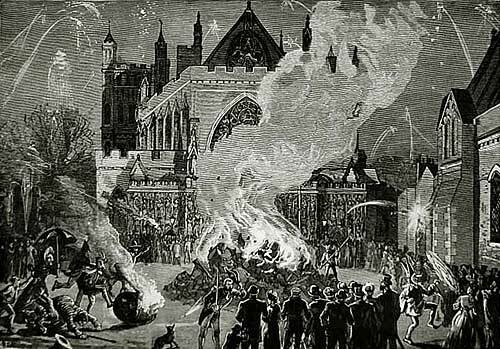 In 1879, the Council boarded up the banks in Cathedral Yard to protect them, but the inevitable riot broke out. The police were attacked with stones and the mob tried to break into one of the banks. The Mayor, William Horton Ellis told the local militia to calm things down, but the rioting continued. He then entered the yard and read the Riot Act and said "Now, Colonel Drewe, do your duty" and the men loaded their weapons. The police under Captain Bent, drew their staves and waded in to the rioters at 1.50am – by 2.10 the crowd had dispersed. This was the last time a Mayor read the Riot Act. One of the ringleaders, dressed as a monkey was given six weeks, and three others were also jailed. Illustration from the Penny Illustrated Paper. 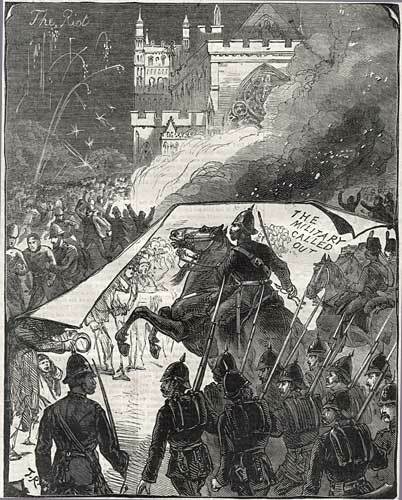 The picture on the right, from the Illustrated London News, shows the celebration in 1882, and the size of the bonfire in front of the Cathedral. An Exeter robbery, in 1880, made the Police Illustrated News with their usual lurid graphic treatment, on the front page. Moses Woolf, a wholesale jeweller, was staying in a temperance hotel, with his stock of 350 watches, 200 rings and 100 chains. Two men at the hotel, who knew of the items, told the night watch, as they were leaving, that they had an early train to catch. The watchman (boots in the sketch) thought they were concealing something, so he quickly dressed and, with a telegraph boy, followed in pursuit. The men started to run, throwing watches and chains into the road. One man was caught, and of the £2,000 of stolen stock, he had £1,500 on his person. On the road '... they found a watch, chain or ring at almost every step.' The men had cut open one bag and filled their pockets, and taken a locked case. The captured man claimed his name was Tanner, a groom from Plymouth, but it was thought to be a false name. A drawing from the book Old Exeter, by James Crocker, published in 1886. 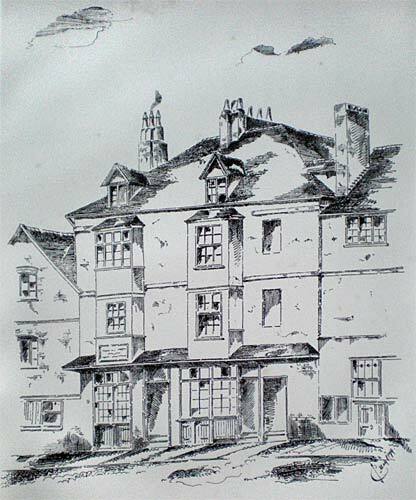 Crocker was an architect who was concerned that many civil and domestic buildings in Exeter were being demolished without a record taken of their appearance. Simon Grendon, Mayor in 1395, 1398, 1405 and 1406, founded Grendon's Almshouses, known as the Ten Cells in Preston Street. By the 19th Century, they were in poor condition, and were demolished and replaced by Grendon Buildings. New Grendon's Almshouses were built in Grendon Road, Heavitree. 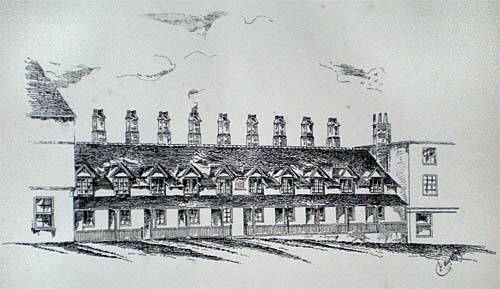 Another drawing by James Crocker, this time of some old houses in Coombe Street. According to Crocker they were occupied by a publican and fishmonger. Whites directory of 1878 indicates a George Lee, a fishmonger and victualer, occupying premises about half way down on the north side – by 1897 Kellys indicate that the building was gone. The photograph, left, was taken by Charles Keeping. He had several studios in Exeter over the years, but his principal studio was by the bridge at the bottom of New Bridge Street. This photograph was probably taken from the studio window during the winter of 1880. 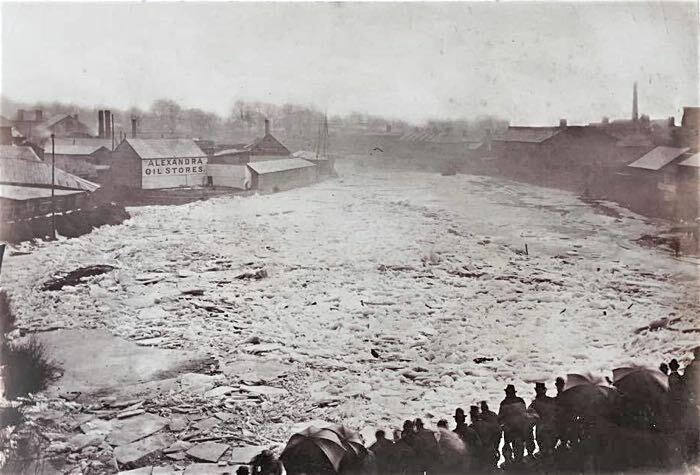 The photo right, is of the 1881 freeze, when a great snowstorm froze the Exe solid. When it began to thaw, the water rose and broken pack ice, similar to the photograph, from up river, jammed under the Exe Bridge. See Trews Weir for the full story. This is a deceiving photograph for it shows a view of the Cathedral that does not seem to have changed at all, and yet is very different from today. The large elms of Cathedral Green are evident on the left, and the cast-iron railing that ringed the Green can also be seen. The soot stained stonework of the Cathedral, was caused by the coal burning foundries and many domestic coal fires in the city, hiding the beautiful, honey coloured stonework. The foundation stone was laid on 13 July 1887 by Arthur Burch, the Mayor. The building was completed in 1888 at a cost of £4,750. The building had a distinctive round corner tower with a conical roof. A Roman mosaic floor of the Prætorium was uncovered and preserved at the foot of the Court staircase. The mosaic floor was removed to the Royal Albert Museum when the building was demolished after 1959, only to be thrown out when a new curator thought it to be Victorian in origin. 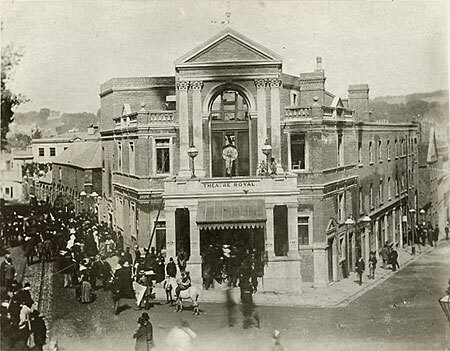 The Theatre Royal fire of 1887 was devastating for Exeter, as many families mourned the loss of loved ones. A crowd in New North Road is milling around, as the New London Inn stables out of the photo, left, were used to lay out the bodies. The smoke blackened shell of the theatre is apparent. 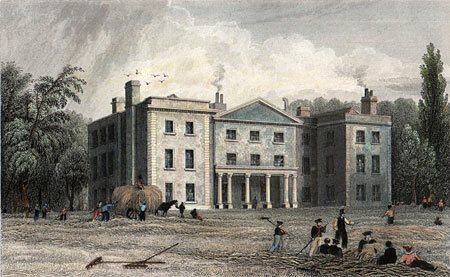 Southernhay West was constructed by Matthew Nosworthy in the 1790s. This photo shows the most northern of the four blocks, which was the one that was destroyed in the 1942 bombing. Notice the iron railings around the centre of Southernhay. The photographer was probably standing in front of the Roundtree Mill. 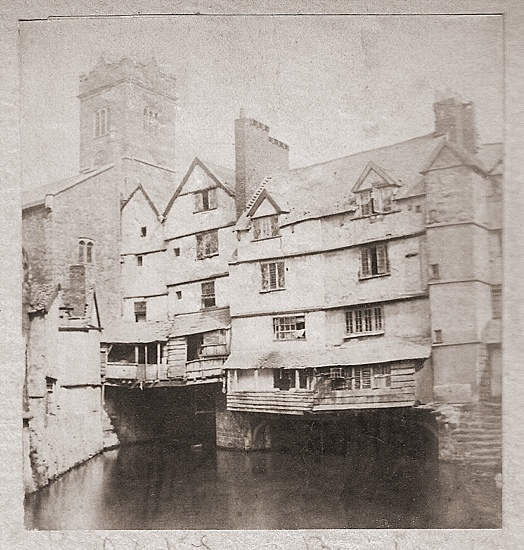 The leat flowed under New Bridge Street and split behind the City Brewery – one arm flowed under the Old Exe Bridge, towards the Quay, eventually joining with the Upper Leat near Cricklepit, while an arm flowed into the Exe. 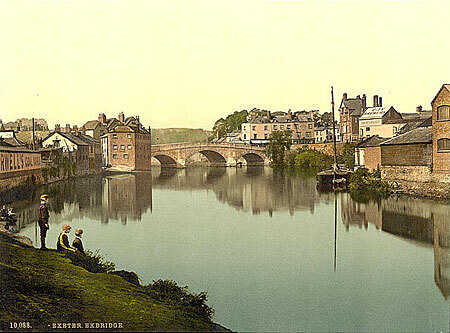 A hand coloured photograph of the River Exe and the old Georgian Bridge. The photographer stood on Haven Banks and Shilhay is on the right. The museum opened in 1869 to the public and soon became an important asset for the city. The Museum Hotel was situated on the corner of Paul and Queen Street. 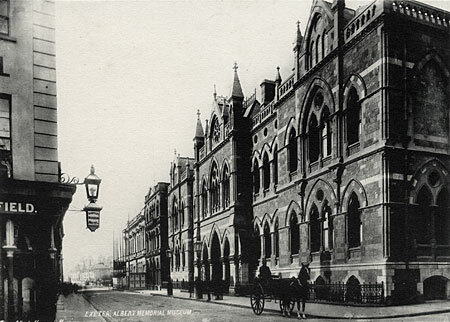 It did not become the Royal Albert Memorial Museum until 1899 when the Duke and Duchess of York (King George V) visited the institution. 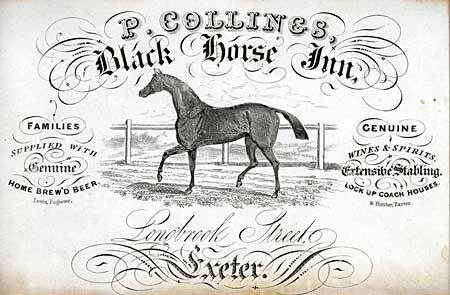 The business card of Paul Collings Junior, who ran the Black Horse Inn between 1852 and 1891. His Spanish born father, also Paul Collings, arrived in Exeter as a young man after serving for the British Army in the Peninsula War and at Waterloo. Both are buried in St David's Churchyard. Topsham had been a prosperous port, but by 1860, the railways had taken much of the trade from the quay. Shipbuilding had also declined and by 1865 there were no more yards in the town. 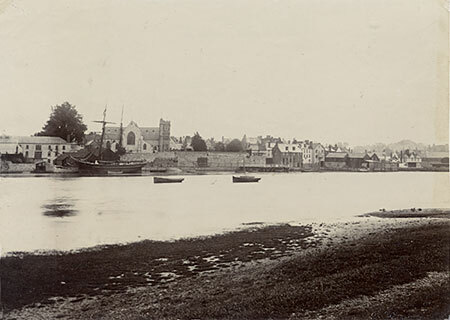 This photo shows the quay from the opposite bank of the river Exe in 1890. Shipping still docked, often to unload into railway trucks, and fishing was still important, especially for salmon in the estuary and river. 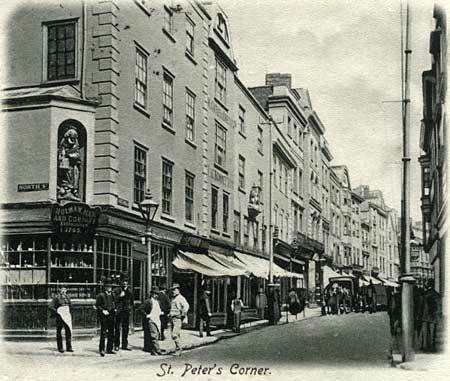 Two views of St Peter's Corner dating from before 1892. The modern Athena on the corner of High and North Street, occupies the old Hepworth's shop. In 1892, the shop was rebuilt for Hepworth's and before that date, the shop housed Holman Ham the Chemist. When Hepworth's took over the premises, Holman Ham moved to the corner of High and South Street. The statue of St Peter is now in the RAMM. The photo left is a postcard, while the image right, is an original photo that may date as early as 1880. A city with a Cathedral and a couple of dozen churches is going to be a ready market for ecclesiastical craftsmen. Beer and Driffield were based in Bartholomew Street producing and repairing stained glass windows and church decoration. 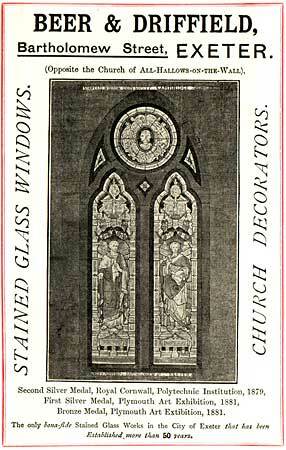 There are still such craftsmen in Exeter supplying stained glass for churches and homes. William Pollard and Co., were just over a hundred years old when this advert appeared in 1894 in a guidebook. They were then based in North Street but have since moved three times to their present works in Falcon Road, Sowton. 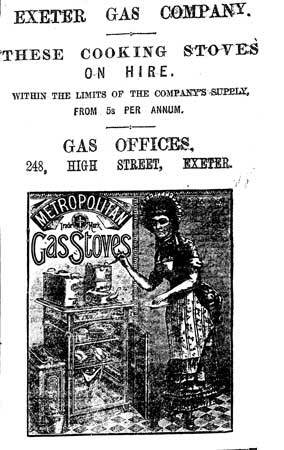 The first illustrated advert I have found for the Exeter Gas Company. They are renting gas stoves, and the busy housewife is depicted preparing a meal for her family on her newly rented stove. It's a pity that she looks like one of the witches from MacBeth. Apart from a small block graphic of a stagecoach or steamship printed for an advert, the Flying Post was slow to include pictures on its pages. Early attempts were often poor in quality, and it was not until the 1890's that the paper started to add graphics on a semi regular basis. 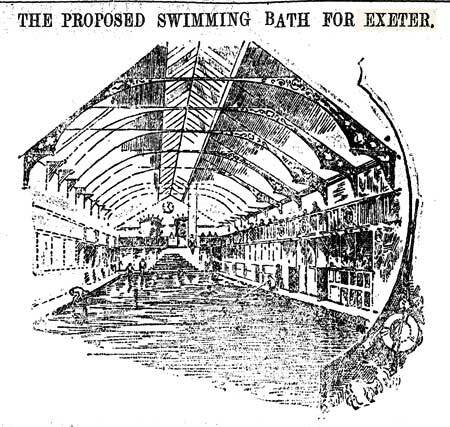 This example is of the proposed new swimming pool at Kings Alley which was built, and then destroyed in the blitz. It was roughly situated in the Musgrave Row car park in front of the Central Library. 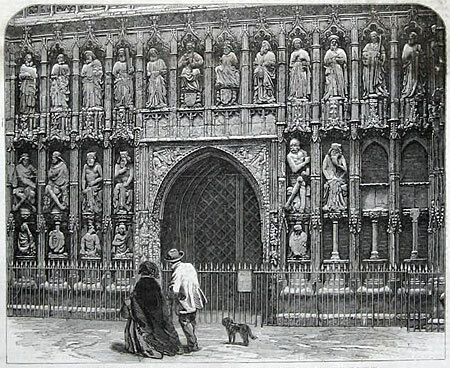 An albumen print of the West Front of the Cathedral in 1894. There were cast-iron railings along the front and two gas lights. It had been about 15 years since the last 5th November bonfire had been built close to the West Front, threatening the stone with heat damage. The print is from an 1861 issue of the Illustrated London News, which demonstrates how accurate the Illustrated London News engravings could be. Queen Victoria acceded to the throne on 20 June 1837. 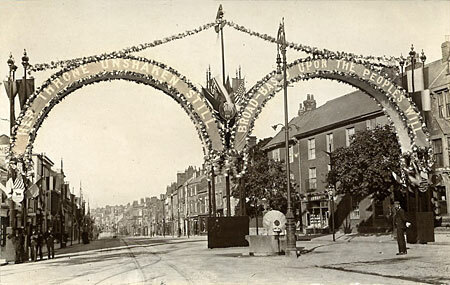 Sixty years later, the people of Exeter celebrated her Diamond Jubilee by creating decorated arches at different places in the city. This one, was at the junction of Old Tiverton Road, Blackboy Road and Sidwell Street. A wood and cardboard North Gate was also constructed by the City Gate Hotel. Other events included swimming matches, a Cathedral service, tea and entertainment for elementary children and a fireworks display in Belmont Park.